Cover art for DC Comics' Final Crisis (2008) by J. G. Jones © DC Comics. Image Source: Wiki. 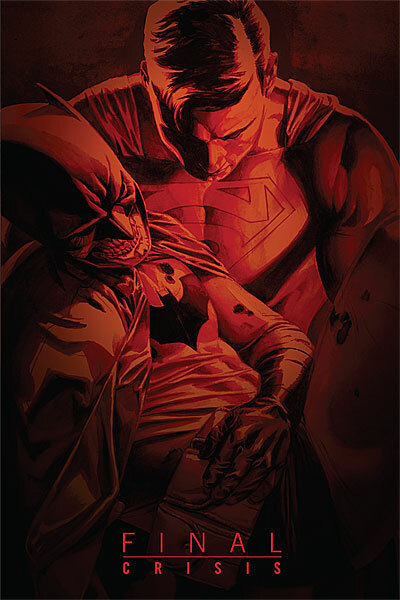 In 2008, DC Comics, publishers of Batman, continued a pattern of pumping dwindling sales by publishing a crossover multi-title event called Final Crisis. The publicity motto for that series was: the day evil won. Top editor and now Co-Publisher of DC Comics, Dan Didio, commented that the series examined the question: "What happens when evil wins?" It is a good question, and an ironic one for Mr. Didio to ask. The answer appears to be: evil wins the day that DC's Millennial virtual fantasies become a reality. What happens on the pulp pages and the movie screen now happens in the cinema itself. Reality has become just like a graphic novel. In an Aurora, Colorado shooting 20 July 2012 at the Batman: The Dark Knight Rises midnight movie première, 12 people died and 70 were tragically injured. Predictably, America's media have launched into a heavily politicized and polarized debate about the right to bear arms, the Second Amendment to the US Constitution. But this election-related argument will take public discussion far off track from the meaning and origins of this tragedy. Guns were not the only weapons used here, since Holmes lobbed tear gas grenades at the crowd, and his apartment is still sealed and under investigation by bomb experts. The apartment is booby-trapped and full of jars of liquid, mortar rounds, trip wires, bombs and incendiary devices, which Holmes likely learned how to make by searching for information on the Web. He also purchased his ammunition over the Internet. Thus, some commentators might begin to ask if we should censor the Internet as we control guns. In this crime, guns and bombs and the information on the Web were not the purpose, but means, to an end. That end is a social malaise which saw the suspected shooter, James Holmes, tell police that he was "the Joker." And in fact, everything, from the gas lobbed into the cinema prior to the shooting, to Holmes's booby-trapped apartment, is very Joker-like. The governor of Colorado, John Hickenlooper, sees this crime as an act of "senseless violence." But labeling 24-year-old Holmes, a graduate student who was in the process of abandoning his PhD in Neuroscience at University of Colorado, as 'insane' does not help to explain this crime. How did someone who was described by his old California neighbours as "clean cut, responsible and studied hard," and who graduated at the top in his undergraduate class in Neuroscience at University of California, Riverside, become someone who said he was "the Joker"? Image Source: Cauldrons and Cupcakes. if you have recently lost a loved one -- that seems to make you more open to the other side, and if you have undergone major surgery or life-threatening illness. There are moments in our lives, where time slows down for us and we are out of sync with the mainstream, such as depression, illness, grief. Those times are the most often periods we are plagued with transients. Perhaps its our change in perspective of what is important, or changing our routine so we slow down and notice things. In periods of altered temporal perception, Sharon believes that people see ghosts. This idea chimes with the idea that ghosts are electro-magnetic shades trapped in time pockets. Psychics and mediums, so the theory goes, perceive the underworld because they read time backwards, against its normal direction. Then again, now, the jarring experience once confined to superstition at worst, and to historians' archives at best, is available to anyone with a video camera and a computer. 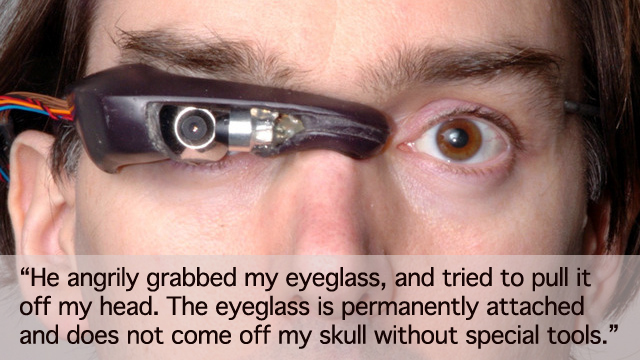 Popular gadgetry has increased people's awareness of time and their ability to manipulate it. Tech affects the temporal progression of language; it enables the mistreatment, misplacement and misunderstanding of historical events on the Internet; it takes cultural phenomena out of their temporal contexts. Computers grant access to whole bodies of historical knowledge, events and images and allow them to be treated like so much random data. Anyone can jumble historical details together in a post-Postmodern collage. 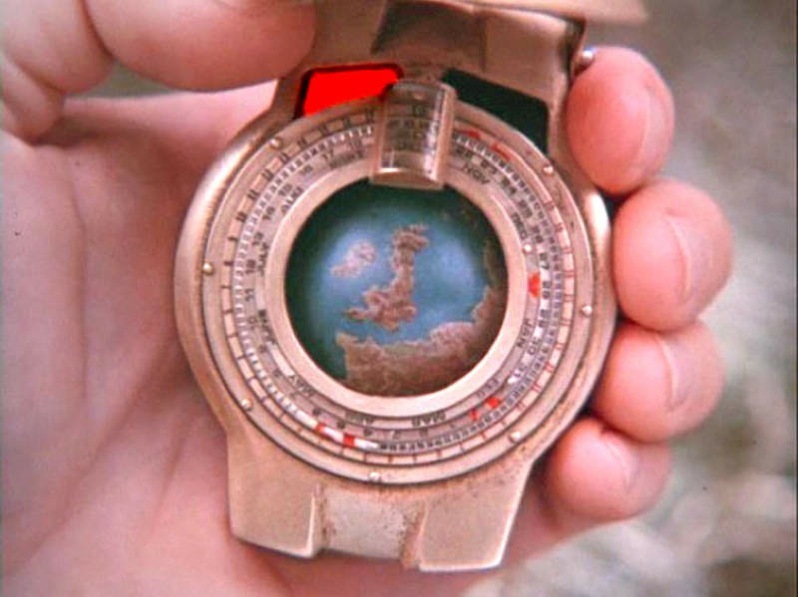 This mish-mash is ordered according to nothing but presentist impulses, with no regard for historical context and respect for forward time flow. This trend has been appearing in a lot of Millennial dramas, fiction and cinema. Tech makes the fictional illness, chrono-displacement disorder, real. Moreover, tech makes chrono-displacement disorder the new normal. The most notable examples of individuals' personal tech-enabled time-plays have so far been fairly benign. People have been more intuitively respectful of the temporal direction of history when they are talking about their own lives. Thus, their plays on time are historically conventional: there are time lapses, wherein people photograph themselves every day over several years, and then put the photos together to make a personal time lapse video (compression of time). Sometimes people revisit a famous event which recurs, decades later (time cycles). Similarly, people retain old footage of themselves and mesh it with new videos, to create a conversation between the past and present (a fairly eternal metaphor of the older man talking to his younger self, which is classic chronal wish fulfillment). For the latest example of the latter, go to the viral video below the jump. It was made by Jeremiah McDonald (see his sites here and here), in which the Gen Y actor and film-maker, who is now 32 years old, talks to his 12-year-old self (via Mike Lynch Cartoons - thanks to -T.). Get me outta here. Image Source: Digital Journal. People are so literal-minded these days. The staunchly faithful believe the end is nigh. The staunchly un-faithful believe the end is not nigh. Either way, the new Millennium's opposing camps of the very religious and the very atheistic seek exactly the same goal: immortality. The irony in this fact - that those who go in for the apocalypse are on the same page as those who go in for the technological singularity - derives from an excess of literal-mindedness. Hayworth has spent much of the past few years in a windowless room carving brains into very thin slices. He is by all accounts a curious man, known for casually saying things like, "The human race is on a beeline to mind uploading: We will preserve a brain, slice it up, simulate it on a computer, and hook it up to a robot body." He wants that brain to be his brain. He wants his 100 billion neurons and more than 100 trillion synapses to be encased in a block of transparent, amber-colored resin—before he dies of natural causes. Why? Ken Hayworth believes that he can live forever. But first he has to die. "If your body stops functioning, it starts to eat itself," he explains to me one drab morning this spring, "so you have to shut down the enzymes that destroy the tissue." If all goes according to plan, he says cheerfully, "I'll be a perfect fossil." Then one day, not too long from now, his consciousness will be revived on a computer. By 2110, Hayworth predicts, mind uploading—the transfer of a biological brain to a silicon-based operating system—will be as common as laser eye surgery is today. It's the kind of scheme you expect to encounter in science fiction, not an Ivy League laboratory. But little is conventional about Hayworth, 41, a veteran of NASA's Jet Propulsion Laboratory and a self-described "outlandishly futuristic thinker." While a graduate student at the University of Southern California, he built a machine in his garage that changed the way brain tissue is cut and imaged in electron microscopes. The combination of technical smarts and entrepreneurial gumption earned him a grant from the McKnight Endowment Fund for Neuroscience, a subsidiary of the McKnight Foundation, and an invitation to Harvard, where he stayed, on a postdoctoral fellowship, until April. To understand why Hayworth wants to plastinate his own brain you have to understand his field—connectomics, a new branch of neuroscience. A connectome is a complete map of a brain's neural circuitry. Some scientists believe that human connectomes will one day explain consciousness, memory, emotion, even diseases like autism, schizophrenia, and Alzheimer's—the cures for which might be akin to repairing a wiring error. In 2010 the National Institutes of Health established the Human Connectome Project, a $40-million, multi-institution effort to study the field's medical potential. Among some connectomics scholars, there is a grand theory: We are our connectomes. Our unique selves—the way we think, act, feel—is etched into the wiring of our brains. Unlike genomes, which never change, connectomes are forever being molded and remolded by life experience. Sebastian Seung, a professor of computational neuroscience at the Massachusetts Institute of Technology and a prominent proponent of the grand theory, describes the connectome as the place where "nature meets nurture." Hayworth takes this theory a few steps further. He looks at the growth of connectomics—especially advances in brain preservation, tissue imaging, and computer simulations of neural networks—and sees something else: a cure for death. 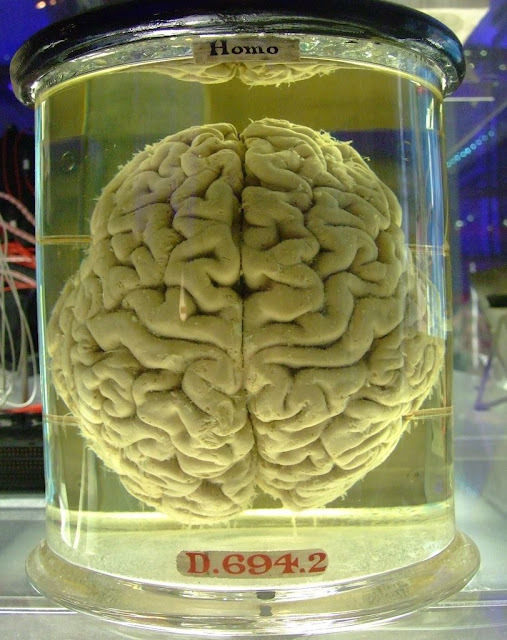 In a new paper in the International Journal of Machine Consciousness, he argues that mind uploading is an "enormous engineering challenge" but one that can be accomplished without "radically new science and technologies." Extreme literal-mindedness boils immortality down to an "enormous engineering challenge." The connectome idea also has a metaphysical side. The connectome curiously reworks the concept of fate. This is a really seductive concept in a troubled (or if one prefers, fallen) world: a proposal to alter destiny on the cellular, genetic, atomic, and sub-atomic levels. Change destiny, whether it comes from nature or nurture, like changing a spark plug. My [The Chronicle reporter's] conversations with Hayworth took place over several months, and I was struck by how his optimism often gave way to despair. "I've become jaded about whether brain preservation will happen in my lifetime," he told me at one point. "I see how much pushback I get. Even most neuroscientists seem to believe that there is something magical about consciousness—that if the brain stops, the magic leaves, and if the magic leaves, you can't bring the magic back." I asked him if the scope of his ambitions ever gives him pause. If he could achieve immortality, might it usher in a new set of problems, problems that we can't even imagine? "Here's what could happen," he said. "We're going to understand how the brain works like we now understand how a computer works. At some point, we might realize that the stuff we hold onto as human beings—the idea of the self, the role of mortality, the meaning of existence—is fundamentally wrong." Lowering his voice, he continued. "It may be that we learn so much that we lose part of our humanity because we know too much." He thought this over for a long moment. "I try not to go too far down that road," he said at last, "because I feel that I would go mad." Yes. Madness arrives, on schedule, when science heads too far into the outer reaches without support. Hayworth may see philosophers as part of the problem. But it looks like he needs one or two of them to watch his back. It does not matter whether you think the world was created by a divine being (or beings) who set in motion a grand battle between the forces of good and evil - or that the universe (or multiverses) exploded in the Big Bang and can be rationally dissected. The real cultural and historically relevant Millennial phenomenon across the board is a literal-mindedness about everything that formerly belonged to the realm of mystery. For the past thirty years, humankind's marriage to technology has enjoyed a lovely, whirlwind honeymoon. With the exception of deadly neo-Luddites like the Unabomber, it seemed the love affair would go on forever. Yet here and there, there are signs that the honeymoon is ending. 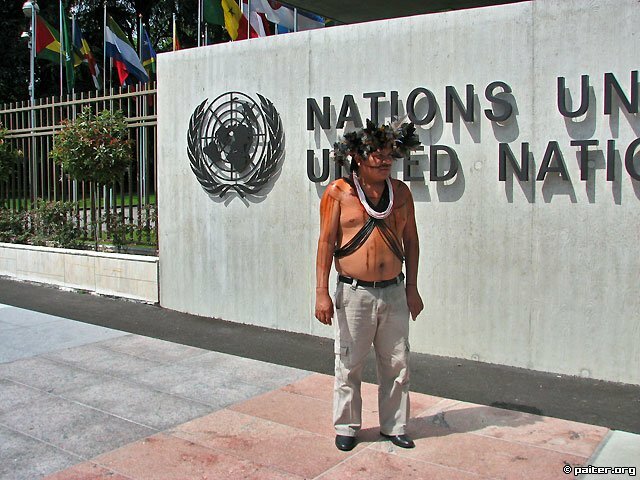 During a visit to New York City, Surui Chief Almir proposed plugging the world of his Brazillian rain forest tribe into Google Earth. Image Source: Paiter.org. GOOGLE unveiled a cultural map of Brazil's Surui indigenous people, a tool that will help the Amazonian tribe share their knowledge of the forest and fight illegal logging. The map, the result of a five-year partnership between Surui chief Almir and the US technology giant, was released online for the first time at a business forum held on the sidelines of the UN Rio+20 conference on sustainable development. The map, a collection of picture and videos mapping historical sites and offering 3D visualisation of Surui territory in the northwestern Brazilian state of Rondonia, is available on the site http://www.paiter.org/ as well as on Google Earth. Donning a multi-colored feather wreath, chief Almir hailed the project that "shows the value of our culture to the world through Google." Almir, who proposed the idea of the map to Google during a visit to the United States five years ago, told a press conference that he was particularly proud of the contribution Surui youths made to the project, including narration. Chief Almir proclaims that "it is time to put down the bow and arrow and to take up the laptop." His tribal territory directly runs up against totally deforested areas. He has provided his people with portable devices which allow them to state their territorial boundaries via Google Earth, to monitor their borders, and to take censuses of wildlife - from jaguars to toucans - and plants in their forest. Find an explanation in English about this project on the tribal Website here. To see the cultural map, you have to first download Google Earth here, and then open the cultural map data here in Google Earth. The map provides clickable information, photos and history (with many accounts of border battle victories) of the intrepid Surui people, along with the location of their villages. There are a couple of Surui Youtube videos about the project below the jump. Image Source: Greater Pittsburgh's New Home. My name is Lori and I own a small cleaning service in the Pittsburgh area. I have 22 customers and 2 employees C.J. And Marie. I am writing this story about one house in particular, yes the haunted one. Before I begin I would like to tell all you non believers of the paranormal to chill out, I am not looking for ghosties they just show up. In the past if I saw something or heard a misplaced noise I would pass it off as whatever, now I am paying a little more attention. In June of 2008 I got my first customer in a very nice neighborhood with all new houses (economy is not effecting this hood). From that customer I was able to get 2 other houses. One was a couple with 2 dogs and the other was a family with 3 little girls. All was great. When we first started cleaning these homes all three of us would go together. The house with the family is quite large 5,000 square feet so as a group we would work our way through all 3 levels. Now the fun starts. Six months into cleaning, the customer request weekly service but only the main floor and the master bath ... . I went my first time by myself and once again the feeling that someone was home was overwhelming. I made it through the whole main floor with no problem. I went upstairs to tackle the master bath, my foot hit the top step and I heard a door slam somewhere in the house. I called out once again," Hello is someone home?" No one was home. I proceeded down the hallway lugging 2 sweepers, a bucket and a bag full of supplies, as I was walking a rubber ball rolls past me into the master bedroom, hmmm... Where did that come from? Whatever, I cleaned the bathroom (takes an hour). Whilst gathering all my stuff and I heard a crowd of voices coming from the foyer downstairs, once again, I called out "hello, whose home?" Got all the way down there with all my stuff, no one was there. For Part 2 to the story, go here. For Part 3 of the story, go here. Click to enlarge: Endeavour Crater. Image Source: NASA via Wired. NASA's Mars rover Opportunity spent the winter at Endeavour Crater in the Meridiani Planum, where it soaked up weak sunlight and took 817 images to make up this panoramic view of the crater. The new Mars rover, Curiosity, is due to arrive on the Red Planet on August 5. For more views of the Martian landscape as seen from space, see Wired's best of 5 years' worth of Mars Orbiter images, here.